The Dock may be one of the handiest features introduced in OS X and the newer macOS. By default, the Dock is located across the bottom of the screen and is always in view. This is convenient because it provides quick access to favorite applications. However, some users prefer to keep every available inch of screen real estate available. To them, an always-visible Dock just gets in the way when they're not using it. Apple designed the Dock to be flexible. You can easily change the Dock's settings, so it only appears when you move the cursor over it. Click the Dock icon in the first row of the System Preference window. ​An earlier version of the OS included category names. If you're working with an older version of OS X, the Dock preference pane appears in the Personal section of the System Preferences window. Put a check mark in the ‘Automatically hide and show the Dock' box if you want the Dock to go away when you're not using it. Remove the check mark if you want the Dock to always be visible. Close the Dock's preferences pane. The Dock will now disappear when it's not in use. You can make it reappear as needed by moving your mouse cursor to the bottom of the screen, where the Dock normally resides. Of course, if you've already moved the Dock to the left or right edge of the screen, you'll need to mouse over the appropriate location to see the Dock. Besides using the Dock preferences to configure whether the Dock will be shown or hidden, you can also control its visibility directly from the keyboard, without making a trip to the System Preferences. Use the Command (⌘) + Option + D keyboard shortcut to immediately show or hide the Dock. This keyboard shortcut toggles the ‘Automatically hide and show the Dock’ preference. The advantage of this method is that you can change the visibility setting instantaneously, without bringing up the System Preferences first. Our last method for quickly changing the visibility setting of the Dock is to use your mouse or trackpad. In this case, the Dock has a secret menu you can access by moving the cursor to the Dock separator, that small vertical line that sits between the Dock apps and any folders or documents you've installed in the Dock. With the cursor highlighting the Dock separator, right-click and select Turn Hiding On to hide the Dock; if the Dock is normally hidden, place the cursor in the Dock area to make the Dock appear, then right-click the Dock separator and select Turn Hiding Off. You can also use the Dock separator to quickly access any of the Dock settings. Just right-click the Dock separator as before and select Dock Preferences. If you don't want to make the Dock totally disappear, you can use the Dock preference pane to control the size and magnification. Size is fairly obvious: use the Size slider to change the overall size of the Dock. You can even set it so small that it is hard to actually see what each Dock icon is for. Magnification is the secret to using the smallest Dock possible. 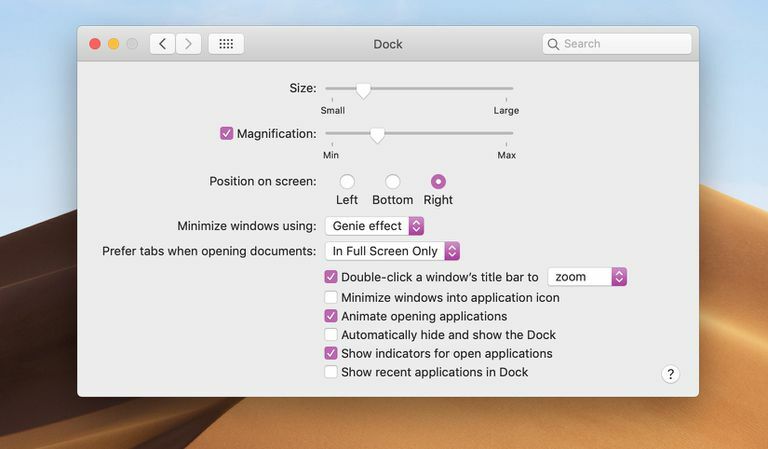 With Magnification enabled (place a check mark in the Magnification box), you can then use the magnification slider to set the expanded view size of the Dock. As your cursor passes over any section of the small Dock, the position under your cursor is magnified, making the portion of the Dock easy to read while keeping the overall Dock small. There is more to the Dock than just hiding and showing. You can make more subtle changes that affect the Dock both in controlling how fast the Dock appears or disappears, as well as eliminating some of the Dock's animation to speed things up a bit more. Try using your Mac with the Dock visible and then invisible, and see which way you like best.